Whether you require private bus airport transfers from Geelong or bus sightseeing tours of the Bellarine Peninsula, Surf Coast and beyond, we work to your timetable, travel plans and agenda, providing a bus and driver for your journey. MyBus Geelong is an affiliate of Geelong Taxi Network and, just like a taxi, our bus charter service will pick you up and drop you off at your front door. We don’t expect you to fit in with timetables and we don’t want you to worry about the inconvenience of getting to or from a bus depot. On the contrary, our bus service is all about your convenience and comfort. What you want is what we deliver. Big group? Not a problem. We have mini buses dedicated to our service plus we also have access to the taxi fleet as a back-up, which ensures we can provide the bus charter service our Geelong and district clientele require and expect. Planning a family or group holiday and need transport to and from Tullamarine or Avalon airports? MyBus Geelong and its partner SkyBus will ensure you and your travel companions arrive at the airport well ahead of your flight’s departure time and will pick you up and bring you home when you return. Got a mountain of luggage? Not a problem. Our Geelong bus airport transfers can include a weatherproof trailer for your suitcases, bags and other items. A friendly reminder: You will need to let us know in advance whether you need a trailer due to high demand availability. Corporate bus charter: Geelong district’s stunning coastal locations have long been popular destinations for weddings and other formal ceremonies but today Geelong, the Bellarine Peninsula and Surf Coast are also popular destinations for high-level corporate and business events. 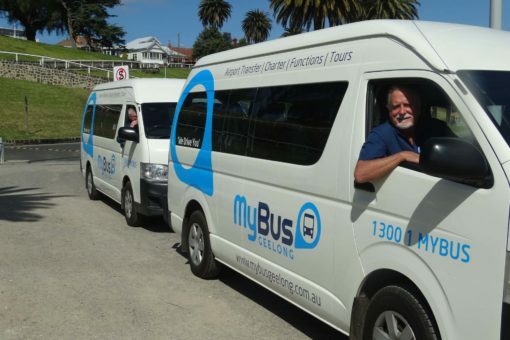 MyBus Geelong provides corporate bus hire for Geelong and surrounding districts, allowing executive teams and business guests to travel together and strategise in comfort. MyBus will also provide the driver for corporate bus transfers so the entire group can focus on the business at hand rather than worrying about driving. Private bus charter: Ideal for weddings, buck’s and hen’s parties, birthdays and other formal occasions, our Geelong private bus hire will ensure you and your guests travel in comfort, safety and style. MyBus Geelong will transport guests throughout the region and further afield, as required, complete with a driver so no-one in the party misses out on the fun. Make sure you take advantage of MyBus Geelong’s bus hire for your next social occasion. Heading off to a concert with friends? Need to shuttle your executive team to a conference on the coast? Got a group organised for the Melbourne Cup? MyBus Geelong provides event bus shuttles from Geelong and return for functions across Victoria. Need a fleet of vehicles to and from your destination? Not a problem because MyBus Geelong has the backing of Taxi Network Geelong and its range of vehicles, including transport for wheelchair passengers. Our shuttle bus service really is suitable for most events. There’s a reason the Geelong district attracts tourists from around the world – we have some of the most spectacular sightseeing destinations in the country and MyBus Geelong’s bus sightseeing tours of the Bellarine Peninsula and Surf Coast are among the best ways to take in the sights. From the Great Ocean Road and Otway Ranges to the region’s numerous wineries and dining destinations, our bus tours for the Surf Coast and Bellarine Peninsula deliver an optimum experience. The volcanic soils that abound in the region make the Bellarine Peninsula and adjoining Surf Coast perfect for fine wines, and what better way to sample the shiraz, pinot noir and chardonnay the area is renowned for than by a bus winery tour! Bus winery tours of the Surf Coast and Bellarine Peninsula mean you can travel from winery to winery with friends and fellow wine-lovers, discussing the finer points of each vineyard and its produce during the journey. MyBus Geelong bus tours are ideal for work or social groups. For more information about MyBus Geelong or to get a quote about our versatile bus hire services, call our friendly staff on 1300 1 MYBUS (1300 1 69 287) or contact us online. Group travel and customised mini bus charter. With a driver! Travel in comfort & arrive on time with MyBus.